Hi everyone! 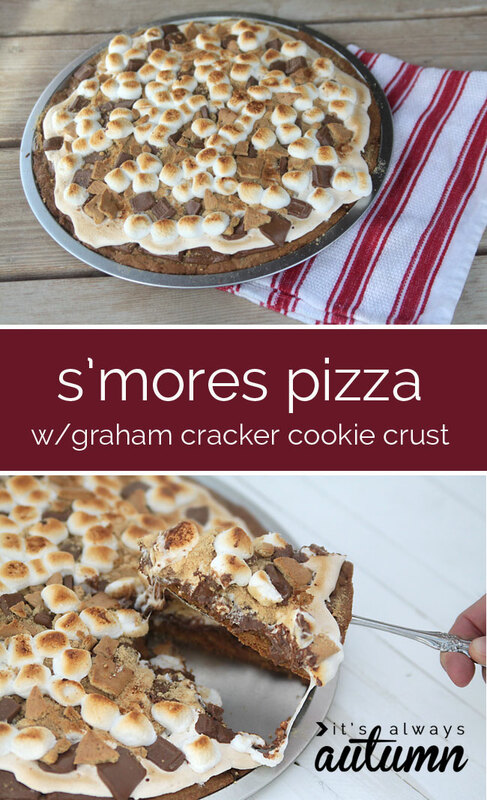 It’s Autumn, here from It’s Always Autumn to share one of my favorite s’mores recipes with you for S’mores Saturdays: S’mores Pizza! Like pretty much everyone else in the world, I love s’mores. I make them over a campfire, I make them in the microwave, and I’ve even made them by toasting marshmallows over the burners on my stove. But as a mother of 5, I have one beef with s’mores: they’re too hard to make in multiples. And when I want my melty toasty treat, I don’t really want to have to make (or help make) 5 to give away before I get one to eat. 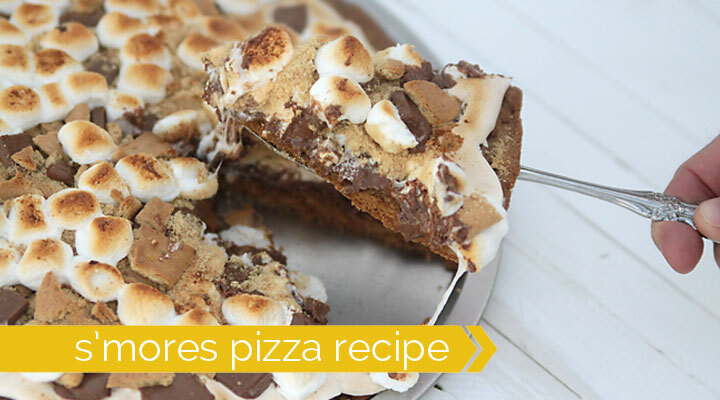 So the s’mores pizza was born: a way to get the taste of genuine campfire s’mores in one big batch in your oven at home so everyone gets to enjoy the hot, toasty, chocolatey goodness at the same time. 1. Mix up the crust ingredients and press into a 12 inch pizza pan (mine’s from the dollar store and works perfectly!). Break up 6 Hershey’s bars and place on top. 2. Dollop out a 7 oz container of marshmallow cream using two spoons – just like you’re dropping cookie dough. Use the back of one spoon to spread it out a little bit, but don’t get too close to the edge of the crust or it will overflow when baking. 3. Bake for 18 minutes. The marshmallow cream will puff up and get a little toasty on top. 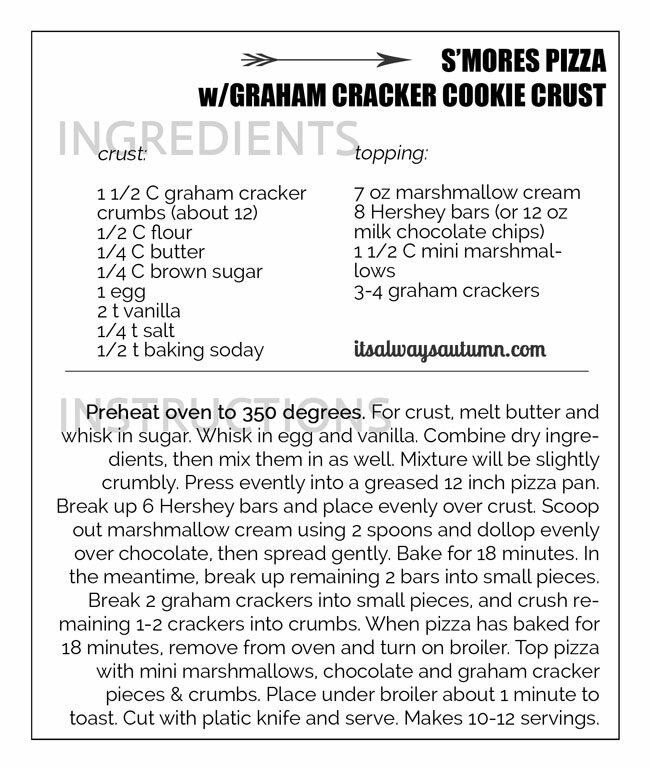 While it’s baking, break 2 graham crackers into pieces and smash 2 more into crumbs. 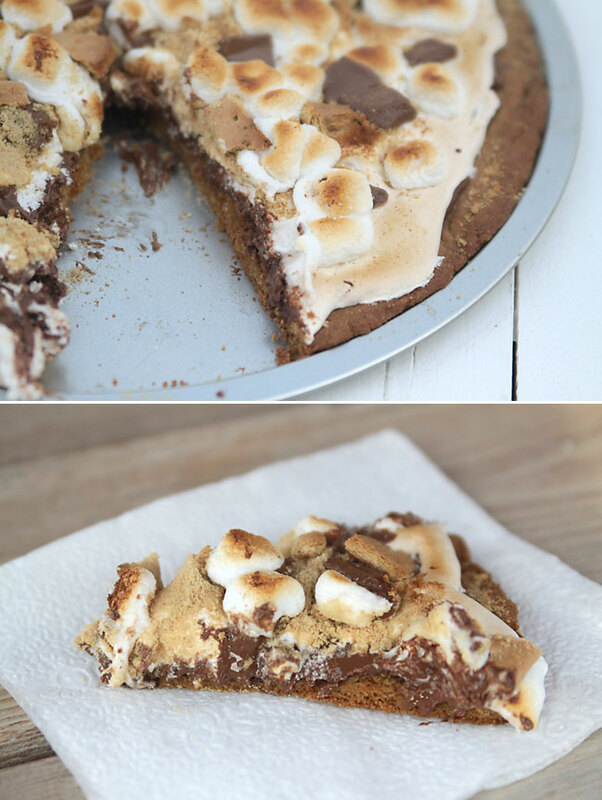 Measure out the mini marshmallows and break 2 more chocolate bars into pieces. 4. Pull the pizza out of the oven and top with remaining ingredients, pressing them down into the puffed marshmallow cream. 5. Broil for a minute or so to get a toasty brown color on the mini marshmallows. Now, don’t put it under the broiler, shut the oven door and leave – believe me! It only needs 30-60 seconds to get the marshmallows lightly toasted. If you leave it a bit longer, the tops of the marshmallows will start to smoke and get kind of dark – it doesn’t look as pretty but I think it tastes fantastic because you really get the toasty campfire taste. Just watch it closely and take it out when you think it looks good. It’s best to let it rest about 5 minutes, then slice with a plastic knife, sawing back and forth gently (the marshmallows don’t stick to the plastic knife as much as they will to a normal knife). The crust will be crunchy at the edges and slightly soft in the middle, and everything else will be melty and gooey. Multi-serving s’mores perfection. 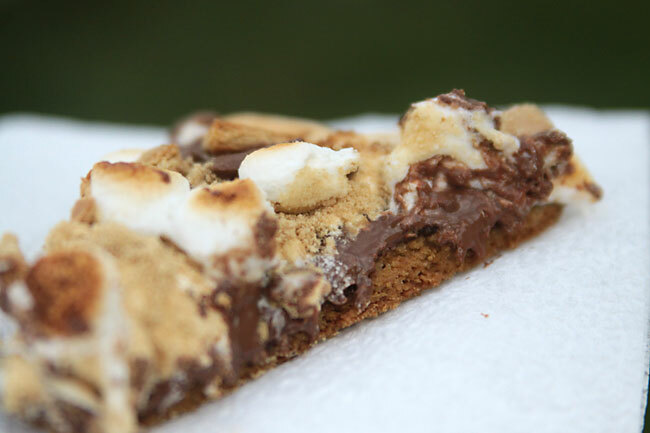 Check out the rest of Sarah’s S’mores Saturdays series for more delicious recipes! OMG!! I totally love smores!! This looks super delicious!! My girls and I are going to make this over July 4th weekend. Delicious!! Thanks so much! !